Aldershot or Leverkusen? Hampshire or NordRhein Westfalon? The Recreation Ground or the BayerArena? Questions we all ask ourselves. But how many of us who choose the latter answers? Hands up the Daggers Diary team. Brian Parish reports on a Saturday well spent in Germany. Let me ask you a question. How long do you reckon it takes to organise one of these trips? Our February jaunt to four different countries was about ten months from the original idea to actually going, while the regular trips to Spain are normally around three to four months from start to finish. I only bring this up, as on Maundy Thursday, I was sitting in work, minding my own business when Dagenham Dan phoned up, saying that Neil had been on the phone, asking what was occurring the following weekend. Now, with the Daggers playing away at Aldershot, we had already made alternative arrangements to visit Southend Manor in the Essex Senior League. However, Neil’s idea was to go slightly further than the Essex coast. At this point, my thoughts instantly turned to how much this was going to cost, without even considering where we were going. 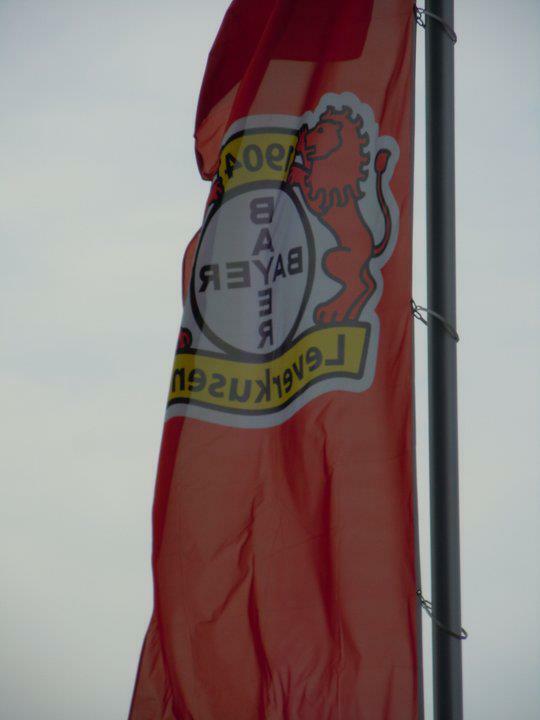 The plan, as it transpired, was to go to Leverkusen. Remember, this was late on the Thursday afternoon. 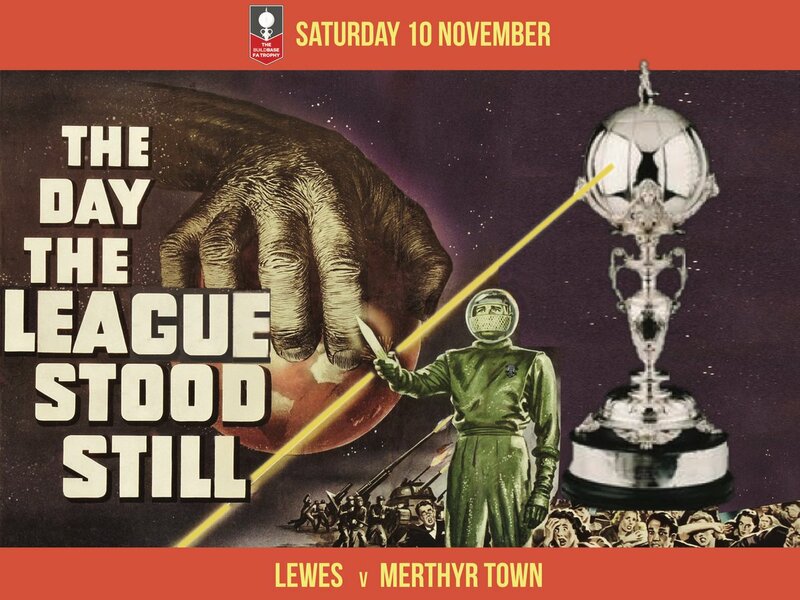 By Friday lunchtime, as we were sitting in the club house prior to the Daggers game against Burton, all the bookings were done and sorted, and we were on our way. Apparently, Neil would have done it sooner, had he not been going out on the Thursday night. So, having thought that the passports were now locked away for the remainder of the season, three of us (which would be Dagenham Dan, Liam and I) set out from Thurrock at 4am on the Saturday morning, on our way to meet Neil at Folkestone services, and our scheduled train crossing at 6.20am. Given the choice of Aldershot, Southend Manor or Leverkusen, I think we all know what we would have chosen. Except that the journey down didn’t go that smoothly. As we made our way on to the M20, the signs were announcing that it was closed between junctions 4 and 6. With no sat-nav to guide us, our sense of direction (which isn’t great at the best of times) took us in the wrong direction having left the motorway. So with phones in hand, trying to find our location, we managed to pinpoint where we were, and after much driving along misty country lanes, we found our way on to the A20, and finally back on to an empty M20. Before we knew it, we were at the services and waiting for Neil to arrive. Now it was the short five minute drive to the Eurotunnel and the journey into Europe. Thankfully, the trip isn’t costing too much. With train crossing and match ticket, it is costing us around £55 each. Putting that into comparison, it wasn’t that much cheaper going to watch the Daggers at Port Vale a couple of weeks ago. That is of course, if the train makes it across. As we get about half way across, the train comes to a controlled stop, due to a train in front. The announcements are vague, with the disembodied voice advising us that they hope that we will be on the move shortly. How useful is that? So, while we sit there, waiting for the train to move, Neil plays with the sat-nav, Dan pulls his hooded top over his head in Obi-Wan Kenobi style, and we all just sit there, waiting for something to happen. Conversation turns to the possibility of doing further trips and also any stamps that happen to be in our passports. You have to remember that it was still early in the morning. The train takes just over an hour, instead of the normal thirty five minutes, but as we emerge into the daylight in northern France, the roads are clear and as we get on to the roads outside the train terminal, we start to make good progress. 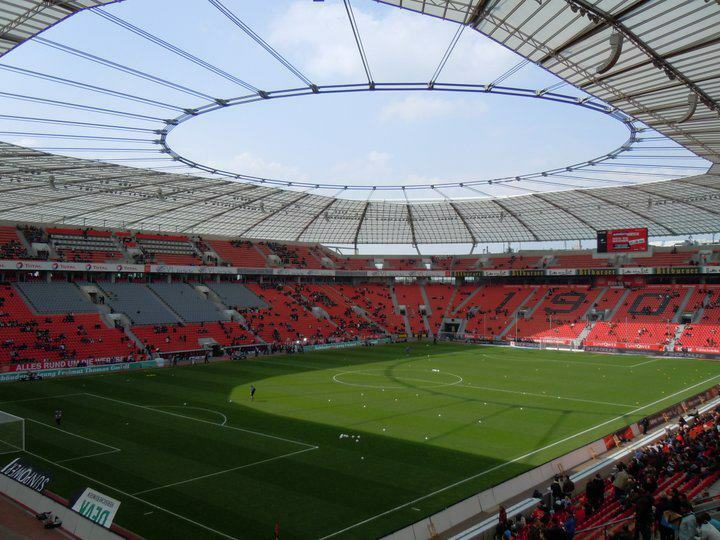 The journey to Leverkusen is reckoned to take just over four hours, which means that we should still have plenty of time to get there and collect our tickets. Arrival in Leverkusen is in bright sunshine, but as soon as we find the stadium, we then have the problem as to where to park. All of the car parks marked on the maps attached to the club website are for pass holders only, so we end up trying to find the shuttle bus park, so that we can get the bus back to the stadium. Once we have found the park though, we are told by a local family parked next to us that the buses do not start running for another hour, so we go to the train station next door. We also explained to them that we had travelled over from London for the game, and were met with looks of amazement and horror in equal measure. However as we are trying to buy tickets, the train arrives and departs before we are able to extract our tickets in time. So, with half an hour to wait before the next service, we decide to walk. After all, it doesn’t look that far on the map. Forty minutes casual stroll later, we arrive at the Bay Arena. After a couple of pictures outside the stadium, we then go to the ticket office to collect our tickets. After the ticket printer manages to break down, (thereby increasing the expectation of a 0-0 after the M20 fiasco and Euro-Tunnel), Neil emerges with the four precious bits of paper. We then try to get round to the club store, but are thwarted by the fact that it is through the turnstiles, and ours are back round the other side of the ground. So, we walk back round, and enter the stadium. The first stop though is the first food outlet that we find. At German stadiums, you don’t just walk up to the counter and pay for your order with cash; instead, you have to top up a plastic card with money, and then approach the counter, thereby paying with the pre-deposited cash. Having spent ten minutes trying to get hold of a card, we finally manage to get one and so head straight for bratwurst. Unfortunately, Liam knocks several of my chips off the paper plate, which prompts a tirade of abuse; no-one but no-one knocks my chips off the plate. I eat the rest of them in silence, before we start for the store. Having now apologised, the mood returns to how it had been pre-chip incident. After spending cash in the store (and having two of our party creating a human roundabout in the store by standing stock still, staring intently and drooling at least one member of the shop staff), we head back, and while Dan and Liam stop off for a second helping of bratwurst and chips, Neil and I head to our seats. Situated in the corner, our view of the away fans is partially blocked by the presence of corporate boxes which I am assured by Neil looks like it should be at Edgbaston, rather than here. Perhaps they share it? Berlin are second from bottom at the start of the game, having lost at home to Freiburg by 1-2 in midweek. However, with Koln imploding, they at least have a chance of getting out of trouble, and are at least capable of getting to the play off game against the third placed team in the division below. Leverkusen on the other hand, are sixth, and while qualification for the Champions League is probably out of reach, they are well placed for the Europa League. Both teams will need a win from today’s game though, and a look at the previous encounter this season shows that it ended 3-3 in Berlin. So, there you have it; another sign that it will be 0-0. To be honest, the first half is almost instantly forgettable. About half an hour in, Dan turns round to us all, and wonders aloud why we all got up so early this morning for this rubbish. The atmosphere is being provided by the two sets of fans that are in opposing corners of the ground. The largest cheer of the half is almost provided when the scores from other games are shown on the large video boards; Dortmund losing gets a cheer, and the half a dozen Borussia fans that have attended (in their yellow shirts as well), sink a bit lower in their seats. The equalizer is cheered a bit louder, but it’s more than a touch worrying that the loudest cheer is when a goal is scored at another ground. Just after the half hour, we get a shot at goal. It’s wide, but when the game has been as uninteresting as it has been so far, you’ll grasp at anything. Leverkusen even have a spell when they are just passing the ball amongst their own defenders, and when it finally goes forward, the four of us cheer, which prompts a couple of locals to laugh. The half looks to be dragging itself to a dull, scoreless conclusion, when out of nowhere, we get a goal. Barnetta picks up the ball in the midfield, runs with it for a while, and passes out to the left, where Andre Schurrle is waiting. He runs at the full back, cuts back in onto his right foot, and his shot is slightly deflected, but flies past the keeper, and hits the back of the net via the underside of the crossbar. Berlin barely have time to restart, and so with no stoppage time added, Leverkusen are 1-0 at the break. If the first half was fairly dull, then the second is anything but. Six minutes into the half, and Leverkusen are two up. Stefan Keissling looks to have over-run the ball following a mazy run into the area. But somehow, he gets a toe to the disappearing ball, and the poke is enough to get it past the onrushing goalkeeper. Given the relative positions of the teams in the league, then it already looks like game over. Except that no-one tells Berlin. Now coached by Otto Rehhagel, they start to pour forward. They have one effort cleared off the line, and while Leverkusen may not have heeded the warning then, they certainly pay for it just after the hour, when the lead is halved. The home team concede a silly free kick near the corner flag, which is crossed into Pierre-Michel Lasogga, whose header eludes Bernd Leno in the Bayer goal. Two minutes later, and the game is changed again. Derdiyok is fouled in the penalty area by Kobiashvilli, and is awarded a penalty. Not only that, but the Berlin recover looks to have been stifiled at birth, as the defender is also shown a red card. Simon Rolfes, the Bayer captain takes the penalty, but his efforts crashes against the crossbar, and the rebound is put wide by Derdiyok. It is a let off for Berlin that they exploit within five minutes. Despite the player disadvantage, it is hard in the minutes after red card and penalty miss to tell who is a player light, as both create chances. However, it is the visitors who score next, which sends the travelling awayn support mad, as well as quite a few Berlin fans who are seated in amongst the home support. There is no animosity though towards them, and most Leverkusen fans just seem to accept that it is their fate to not win the game as Hertha celebrate. The goal arrives thanks to good play down the left wing by Nikita Rukavytsya, and his low cross is turned in by Torun, only a few yards out. From nowhere, Berlin have come right into this game, and with a player less as well. If it’s good for the visitors at 2-2, then four minutes after the equalizer, they go in front. The goal actually comes from a Leverkusen corner which is cleared, and then following a mistake ten yards inside the Berlin half, Raffael is allowed to run sixty-odd yards before squaring the ball to Torun who has caught up to him, on the edge of the area. His shot is true, and finds the corner of the net. Three of us look at each other in amazement at what we have just seen, which includes Dagenham Dan jumping up in celebration. Eighty-two minutes pass when Berlin create the chance to make it 4-2. Raffael is allowed to escape his marker again on the half way line, and heads straight for the Leverkusen goal, but instead of trying to find a team mate, he elects to shoot, and puts his effort wide. In a half that has been totally enthralling, we wonder how long it will take for him to regret that missed opportunity. It was all of two minutes if you’re wondering. Keissling heads his second goal of the game, following a floated free kick by Gonzalo Castro, and now the score is 3-3. Even at this late stage, both teams still create chances to win it, but even with two added minutes, neither team can fashion a winner, and while both may be disappointed to have dropped points, the four of us can not complain about a game that has contained six goals, a missed penalty and a red card. And all this after complaining about a poor first half. Anyone with a spare few pounds in the summer will do no wrong in laying some money on Germany for the Euro’s based on this second half display of internationals such as Keissling. 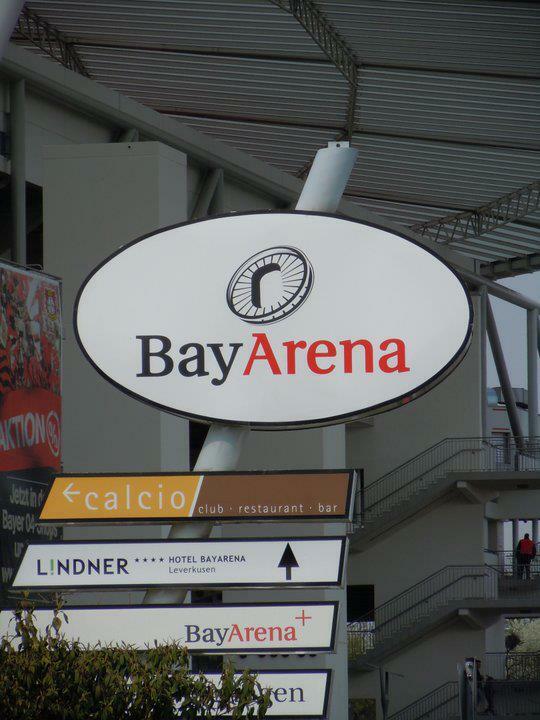 This entry was posted in Bundesliga, European Football, Germany and tagged Bayer Arena, Bayer Leverkusen, Bundesliga, Germany, Hertha Berlin. Bookmark the permalink. Definitely go to Gladbach. 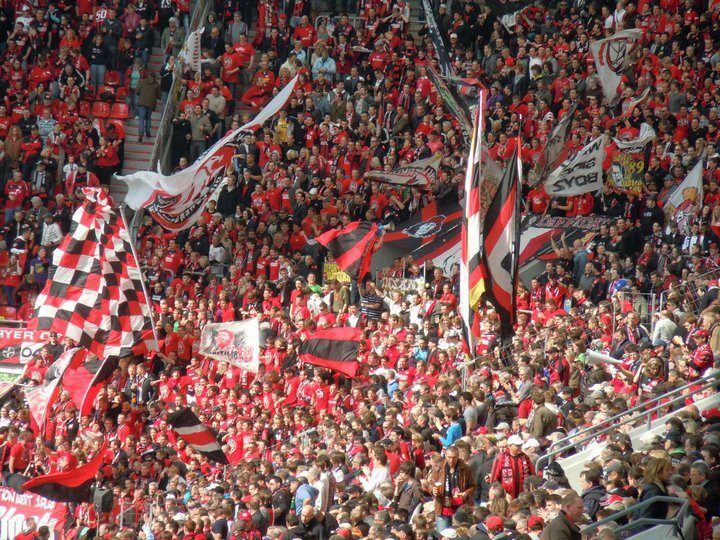 Leverkusen and Wolfsburg have by far the worst fans in the division with a real lack of atmosphere. Gladbach, on the other hand, have a great fan base and they are playing absolutely stunning football this season (I’ve been watching them on tele a lot). Nevertheless, this probably won’t last as their key players Reus, Neudstader (and very probably Dante) are leaving in the summer, so it will be like your last chance to watch “Borussia Barcelona” in action. Having said that, if you do go to Gladbach’s match your prospect of a 0-0 draw could be fairly high… But ya, youtube Borussia Barcelona to check out what they’ve been up to this season, I never get tired of watching that video. Gladbach is sold out for the 28th unfortunately so myself and Dan are going for the slightly shorter trip to Belgium to watch Gent vs Club Brugge. 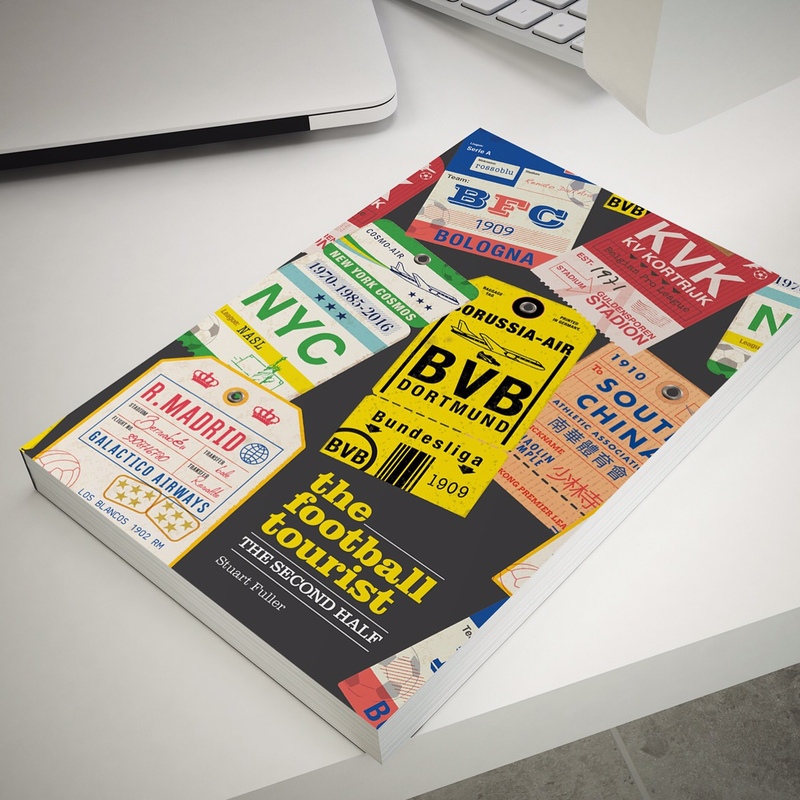 Gladbach is definitely on our list of “must do’s” for next season though! 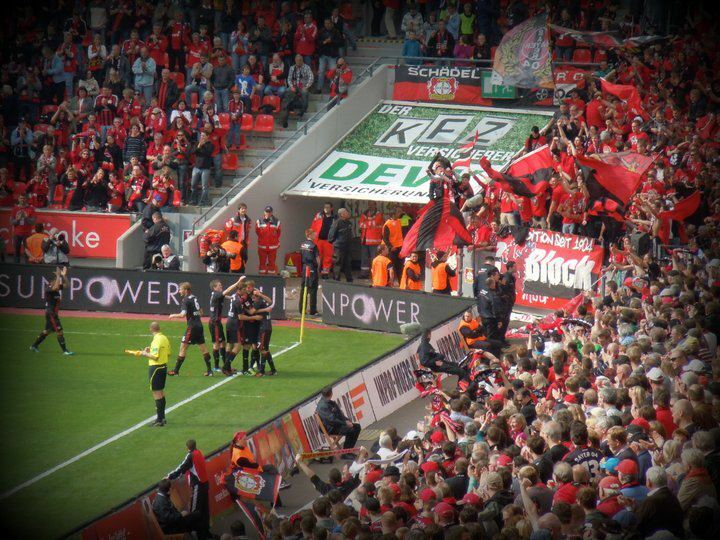 As enjoyable as Leverkusen was, I do tend to agree about their supporters. Compared with the game we to in Koln a few weeks ago, the atmosphere was relatively flat, and full of neutrals which I also found strange.